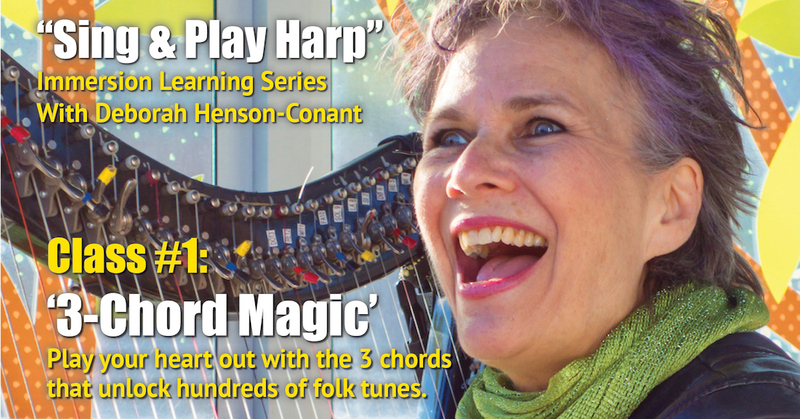 “Sing & Play Harp: 3-Chord Magic”! ARE YOU A CURRENT MEMBER OF HIP HARP ACADEMY? If so, this class is INCLUDED in your yearly Membership – just go to your dashboard to find it. Not a Member yet? Join the full yearlong Academy to get ALL the classes PLUS the “Sing & Play Harp” Immersion Series – PLUS live chats and resources. Got questions? Use my “Ask a Question” form and I’ll get back to you as soon as I can! √ Just sit down and sing and play – any time you want, without music, all alone for fun… or with friends and family ? √ Have a set of SIMPLE STEPS to follow as you learn to understand the basics of how singing-and-playing works – so you could create your own songs. If you have basic to advanced harp skills from advanced-beginner level to professional, this class will give you the skills to do all this and more – to just sit down and play and sing – from a sheet of lyrics and chords, just the way folk guitarists do. with chords and picking patterns you use over and over in different ways. √ You’d be singing song people love in therapeutic situations – or, better yet, play for them to sing with you. Most importantly – you’d be truly DOING it – not just ‘learning how’ – but doing it, connecting, sing and playing and having so much fun doing it! What if you could learn right in your own livingroom when YOU wanted to learn – day or night? And go over the lessons again and again if you like. Singing with the harp is a much more intimate way to connect -and playing simply gives so much emotional support to the singing. I felt so supported by the harp to sing. To feel that support from myself created a huge connection with myself and the instrument and all of you out there. "Clear Instruction Locks it In"
"It Sounds Nice & Full"
"This is great! I'll use this with kids"
How does the “Sing & Play Harp” Immersion Series Work? The classes in this series are called “Immersion Classes” because it’s most effective to take the entire class in one day – and then start putting it into play. Of course, you can also review it – or take it at your own pace – you’ll have 3 months access. But you won’t need that. Once you learn the basics, it’s all about putting them into play and starting the process of gaining fluency and opening to discovery. It’s a Series – because I’ve planned it as 5 separate classes. As I build the program and add more Immersions to the series, you can buy each additional immersion as an add-on if you want to move on to the next level. Each new immersion class unlocks a new level of completion – but you don’t have to move through all levels to be able to sing and play to your heart’s content. I’m building the series with these ‘stopping points’ because I want you to take time between each level and put what you’ve learned into play – because that’s where the magic really happens. I also want you to know that you can be fully expressive at each level – and to explore that. As you become fluent at each level and learn to ‘speak’ with the music, you’ll start to discover new things you can do – and to connect more with your yourself, your instrument, the music – and other people! “3-Chord Magic” teaches you the 3 basic chords that unlock your ability to play hundreds of folk songs, how to play these chords so well you can do it with your eyes closed, how to coordinate playing with singing, add a bass-line – and how to do this all by yourself – or with friends. You’ll get a 12-song setlist (lyrics & chords), a 5-minute warmup you can do daily, and video lessons you can watch over and over so you know how to put it all together. These patterns help you play the chord patterns even with your eyes closed! Once you know the basic pattern, it’s easy to shift it to new keys to can find the best key for your voice for each song. You’ll get a 12-Song setlist of traditional folk songs that only use these 3 chords (you’ll be surprised what they are!) – plus a bonus peak at the next level in this series with songs that use just one or two more chords. Add a simple left-hand to create your bass – or play with a friend and split the bass & picking pattern between you! Now you’ll sit down and sing and play and sing and play and sing and play, creating a simple arrangement as you play by using the warm-up patterns you practice every day. Training Videos and Set List. Register Now for "3-Chord Magic"
Purchase includes 3-Months access to all online materials PLUS download of all PDFs & MP3s from the class. 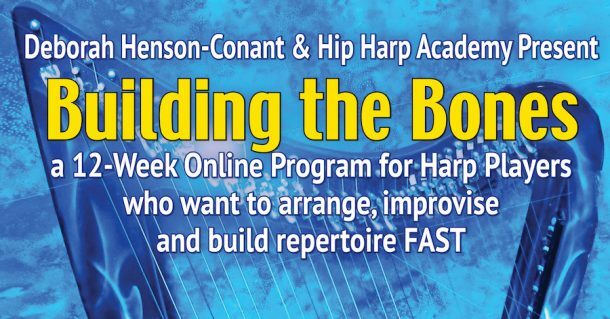 NOTE: All students currently in Hip Harp Academy at the FULL Level – are ALREADY REGISTERED for this class. DON’T REGISTER AGAIN if you’re already taking ongoing classes at the Academy. – and will get ALL bonuses announced for this program (so if you’re already a FULL-Level member of the Academy, don’t sign up again!). If you’re not in the Academy and you want to make sure to get absolutely everything, including a full year of classes at Hip Harp Academy check out Hip Harp Academy Yearlong Membership Here or just register here. Hip Harp Academy Full Yearlong Membership includes “Sing & Play Harp” PLUS over a dozen other classes in arrangement, improv, jazz & blues PLUS any bonuses I create for classes and series like this one. If you have questions about how it works, just email using my Ask a Question Form. Hi! 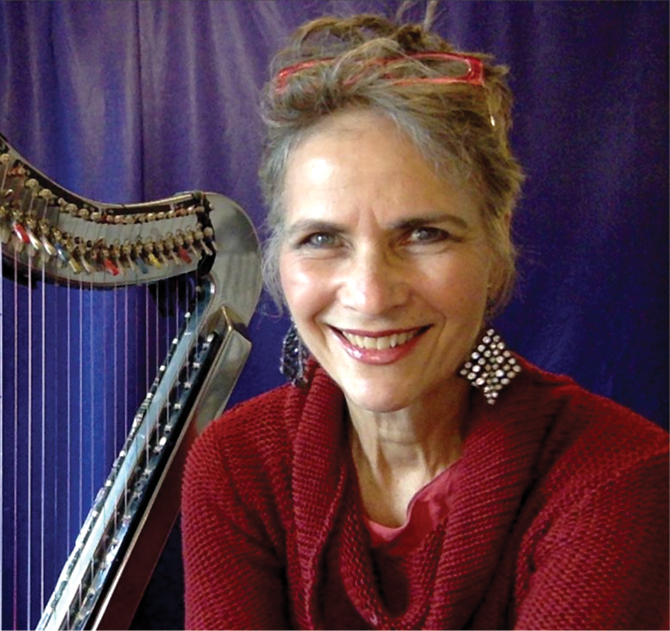 I’m Deborah Henson-Conant – and singing-and-playing harp is one of my favorite things to do. I learned my first 3 chords on the ukulele when I was 7, and in that moment, I realized that being able to accompany my own singing gave me freedom and power to express myself. And little by little I shared it on stage. Now I sing in every show – even if I’m hired as an orchestral soloist. And I love to sing with the audience, too — especially with an orchestra accompanying us. And it all started with 3 chords on the Ukulele. That’s where we’ll start with “Sing & Play the Harp” – only we’ll use a harp instead of a ukulele. And we’ll take it as far as you can go. “Sing & Play the Harp” is a brand new program. You’ll be joining the BETA team, which means mega-fun and a special Beta price. Get on the First to Know list now – and for a super special discount, fill out the survey. The links for both are at the top of this page. And then – let’s sing … and play! “You provide the most inspiring, amazing space for students to break through the challenges, let go, and feel free. It is so fascinating how you explore the emotional and spiritual aspects of music together. If there is one lesson that DHC emphasizes over and over, it is to appreciate and enjoy what we can do at this time, knowing that we can and will continue to improve. This support has had an effect on me that has gone beyond my harp-playing. Vocal Technique. We will be singing from the start, and we won’t be focusing on how you sound. but our focus is on how to combine singing and playing. If you want to work on your vocal technique, your sound, or your ease of singing, I’ve arranged a special discount from a well-known voice-coach in the Boston-area who can work with you virtually – either 1-on-1 or in her online classes. Vocal-instrumental ‘arrangements’. You will get – as a bonus – two of my simplified arrangements for harp and voice, but this class isn’t about learning to play vocal-instrumental arrangements. It’s about being able to sit down to play-and-sing like you would sit down to have a conversation. Songwriting. We won’t be talking about song-writing in this series – though you’ll definitely be able to apply what you learn in this series to writing your own original songs. Music is about Connection ~ not perfection. And commit to having big, wonderful FUN, learning to ..
it’s all we have to bring.